this is the makeup date for the show that had been cancelled due to the winter Noreaster, Showtime 8:00 doors open at 7:00 Angel Band makes big noise. Loud noise. Boisterous, sad, sweet, goofy, glorious and angelic. Any which way you look at it this stuff gets your attention. Whether it's the crazy tight three part harmony, the killer backup playing, the stories, the passion or the compassion, it gets your attention. The songs are mostly self-penned, weaving vivid images, powerful lyrics, musical integrity and "chops" to write home about. 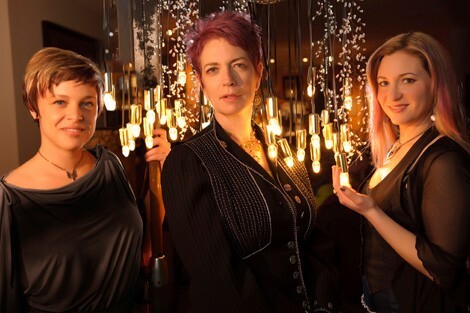 The core of the band is held by the three singers: Nancy Josephson, Aly Paige and Kathleen Weber. All are experienced on lead and backup vocals. The love of the sound that three female voices make together is at the center of this group. The chord rules the day. Both mystical and elemental when the three hit "it" the hair on the back of your neck's gonna stand up. The difficult to pigeonhole sound that emanates from the band roams from old time "mountain" music to contemporary rock and roll influenced originals. You'll hear a fusion of folk, roots, blues, country and gospel-tinged throw downs. Any way you slice it this band catches hold of you and won't let go.